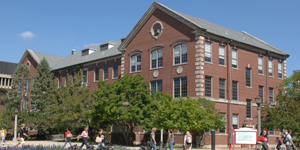 Felmley Hall of Science contains offices from the Department of Biological Sciences, the Illinois State Planetarium, the Department of Health Sciences, and the Department of Geography-Geology. Felmley Hall of Science is named after David Felmley, President of Illinois State Normal University from 1900-1930. David Felmley was an advocate for the needs of students and faculty for three decades and worked to expand areas of curriculum. Felmley Hall opened in 1930. In 1962, the University received a grant from the National Science Foundation to assist with a $1.8 million annex.